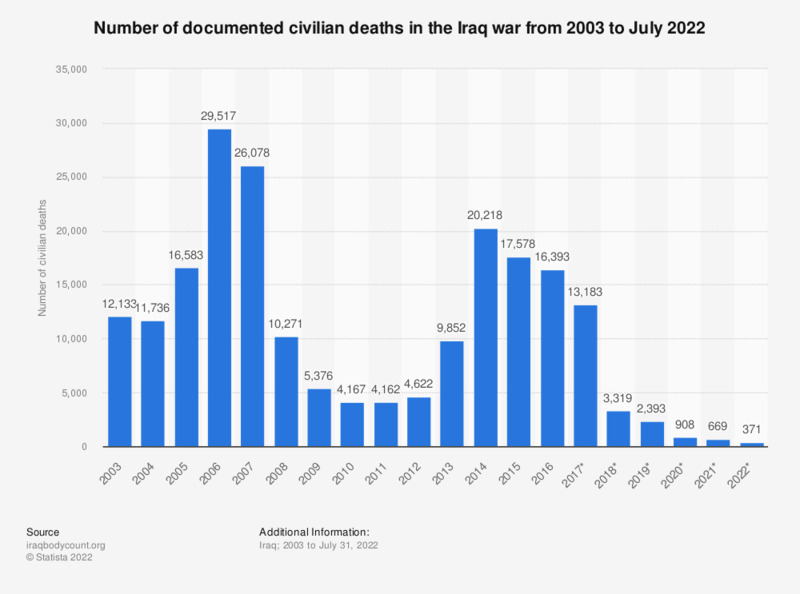 The statistic shows the number of documented civilian deaths in the Iraq war between 2003 and March 31, 2019. As of March 31, there were 717 documented civilian deaths in 2019. Civilian casualties are the deaths of non-military individuals as a result of military operations. The number of documented civilian deaths in the Iraq war peaked in 2006 at 29,517 casualties. Since then, the number had fallen to 4,162 casualties documented in the year 2011, and has been on the rise since then. Due to the nature of the Iraq war and of war reporting, data cannot be considered exact. Many civilian deaths that occurred during the war in Iraq may remain unaccounted for. The Iraq war was launched in March 2003 upon the invasion of Iraq by US forces. Eight years later, in December 2011, the US formally declared an end to the Iraq war. From the start of the war in 2003 until September 30, 2015, it is estimated that the United States spent a total of over 819 billion US dollars on war costs in Iraq. This number includes funding requested by the President and appropriated by Congress, and accounts for both military and non-military spending. Spending was highest in 2008, that year over 142 billion US dollars were spent in Iraq by the United States government. As of 2017, about 33,290 US active-duty military personnel were deployed in North Africa, the Near East and South Asia. The number of US American soldiers killed in Iraq peaked in 2007 with just over nine hundred causalities. In the same year, there were over 25 thousand civilian deaths in Iraq.